Enjoy the Flavor and Ease of Eating Fresh, Local Foods | Cook It Quick! First tomato of the season from my tomato plant. Delicious! One of the fastest ways to “cook it quick” is to eat fresh, local foods in season. Flavor is at its peak and little or no additional “cooking” is needed. Often, all you need to do is: Slice! Eat! Enjoy! 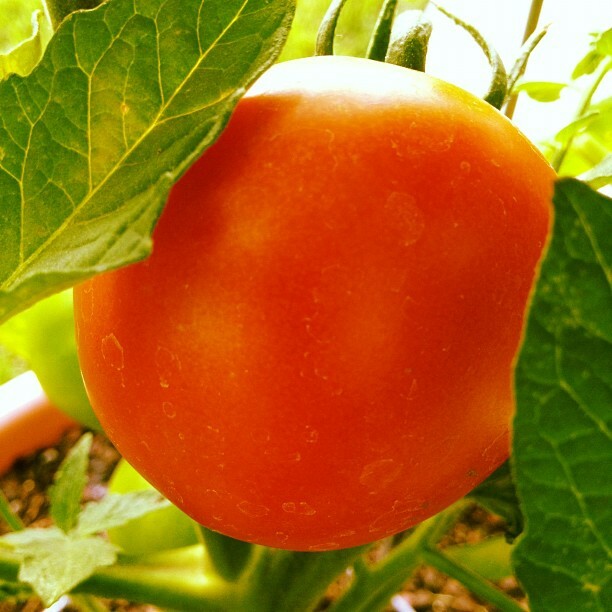 Whether it comes from your garden, grocery store, or farmers market, it will be “simple”- ly good! Visit the food.unl.edu website for several recipes featuring seasonal foods. This entry was posted in Local Foods and tagged alice henneman, cook it quick, healthy cooking, nutrition, tomatoes. Bookmark the permalink. That tomato looks like a beauty. So you have a green thumb too!!!! Hi Diane, the 3rd time’s the charm. Failed miserably with tomatoes the last 2 years. Can’t wait to eat this today in tabouli! So nice meeting you in Manhattan!